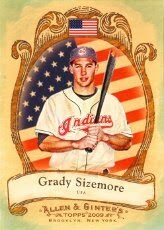 I've been collecting him since I met Grady Sizemore in 2006 at an Indians press conference. I’m looking for any cards not on this list to buy or trade. Email me at b-oinks@gmail.com (remove the dash!) or comment here! Autographs in BOLD and Italics, relics in Bold.